Despite last year’s drop in ERISA cases, lateral opportunities remain buoyant for L&E attorneys, thanks in large part to a continued rise in wage and hour litigation. Even though employers are settling fewer discrimination cases than anytime in the last 10 years, cases brought under the Fair Labor Standards Act have continued to increase. Gerald L. Maatman Jr., co-chair of Seyfarth’s class action litigation practice group, attributes the rise to the relatively low barrier entry for plaintiffs bringing wage-and-hour cases under the FLSA. Others meanwhile paint a different picture, attributing the boost to the failure of the Department of Labor to enforce violations, thus creating a climate of more widespread violations, and subsequently, more cases. Irrespective of the reason, one fact remains certain, if you’re a West Coast L&E lawyer, times are good. 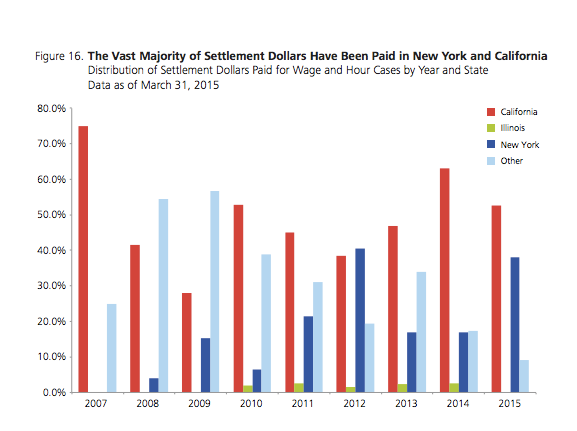 California leads the country in wage and hour settlement dollars. According to a recent study, on average U.S.-based businesses with at least 10 employees have a 12.5% chance of having an employment liability charge filed against them. Employers with at least 10 employees in California, meanwhile, have a 42% higher chance over the national average chance of being sued by employees. Most attribute the discrepancy to California’s state employment laws, which are often times broader and more employee friendly than their federal counterparts. It should come as no surprise then that California also serves as the leading market for lateral L&E opportunities nationwide. There have been 321 new lateral positions nationwide since January 1, over one third of which were based in California. Many of these positions were posted by L&E boutiques, which have carved out increased market share in recent years due largely in part to their flexible rate structures. In many cases, large international firms simply cannot compete. But for L&E lawyers seeking to maintain their Biglaw salary or simply to hold onto the myriad benefits of a full-service platform, there is good news — you don’t need to write off the heavyweights anytime soon. Indeed, there are still numerous powerful players among full-service Am Law 100 firms with active and well-supported L&E practices. Firms like Morrison Foerster, Orrick, Arnold & Porter, Sheppard Mullin, Morgan Lewis, and Paul Hastings have all approached us with openings in the last quarter, primarily targeting wage-and-hour experience. Due to the complexity of the cases, class-action experience is typically prioritized, though in many cases not a prerequisite. In recent months, we’ve also seen an uptick in employment counseling lateral opportunities from Bay Area powerhouses like Cooley and Wilson Sonsini, whose strong corporate practices provide a wealth of cross referral opportunities for counseling specialists. For attorneys looking to eventually transition in-house, these are also excellent springboards to those opportunities. Regardless of your long-term goals, labor and employment opportunities appear stronger than ever in California, which is saying something given the strength of these practices during the recent economic downturn. For those looking for security in good times and bad, there may very well be no better practice.